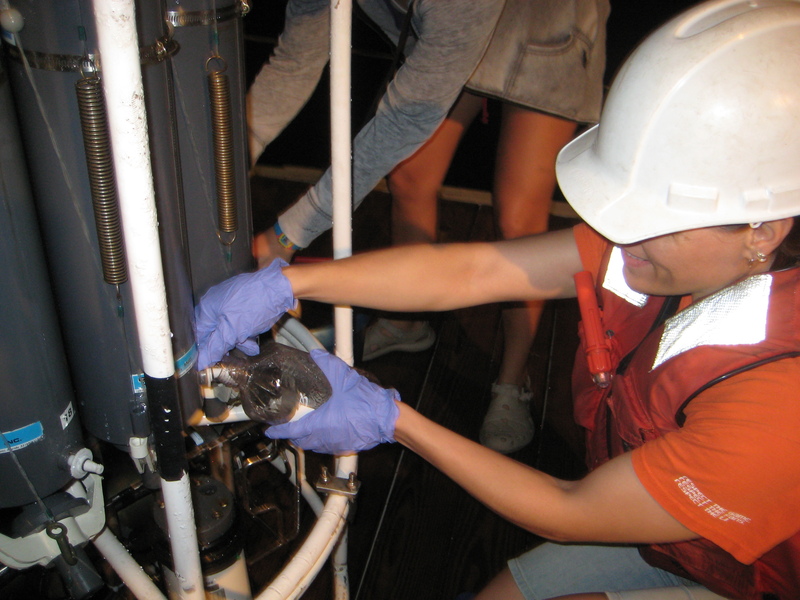 Here I am taking a water sample from the CTD. Let’s talk about the flurometer! 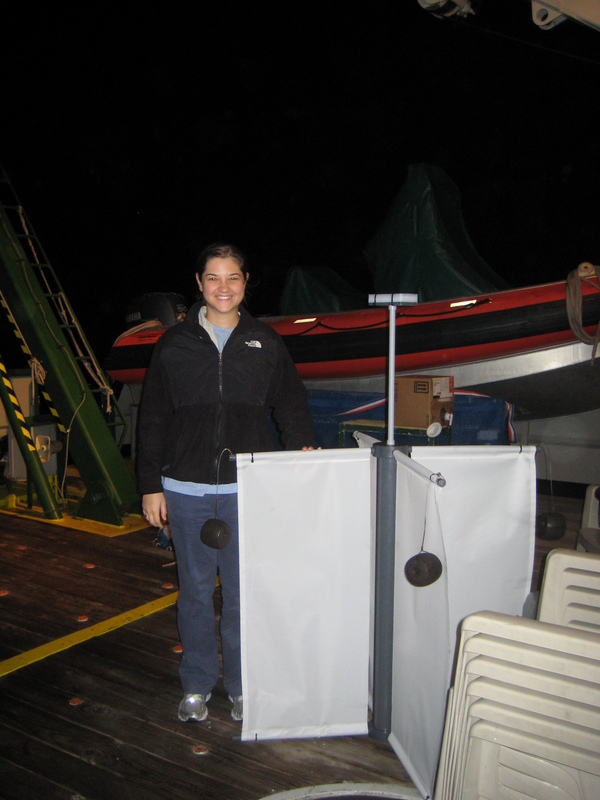 The flurometer is a piece of equipment attached to the CTD which is being used on this cruise to measure the amount of chlorophyll (specifically chlorophyll_a) in the water being sampled. It works by emitting different wavelengths of light into a water sample. The phytoplankton in the sample absorb some of this light and reemit some of it. The flurometer measures the fluorescence (or light that is emitted by the phytoplankton) and the computer attached to the CTD records the voltage of the fluorescence. The flurometer can be used to measure other characteristics of water, but for this research cruise, we are measuring chlorophyll. As you know, chlorophyll is an indicator of how much phytoplankton is in the water. Phytoplankton makes up the base of the marine food web and it is an important indicator of the health of the surrounding ecosystem. At the same time that our cruise is collecting this information, satellites are also examining these components of water quality. The measurements taken by the scientific party can be compared to the measurements being taken by the satellite. By making this comparison, the scientists can check their work. They can also calibrate the satellite, constantly improving the data they receive. Combined with all the other research I’ve written about in previous blogs, the scientists can make a comprehensive picture of the ecosystem with the flurometer. They can ask: Is the water quality improving? Degrading? Are the organisms that live in this area thriving? Suffering? Nelson records data from the CTD. Collecting data can help us make decisions about how better to protect our environment. For example, this particular scientific party, led by Nelson Melo, was able to inform the government of Florida to allow more freshwater to flow into Florida Bay. 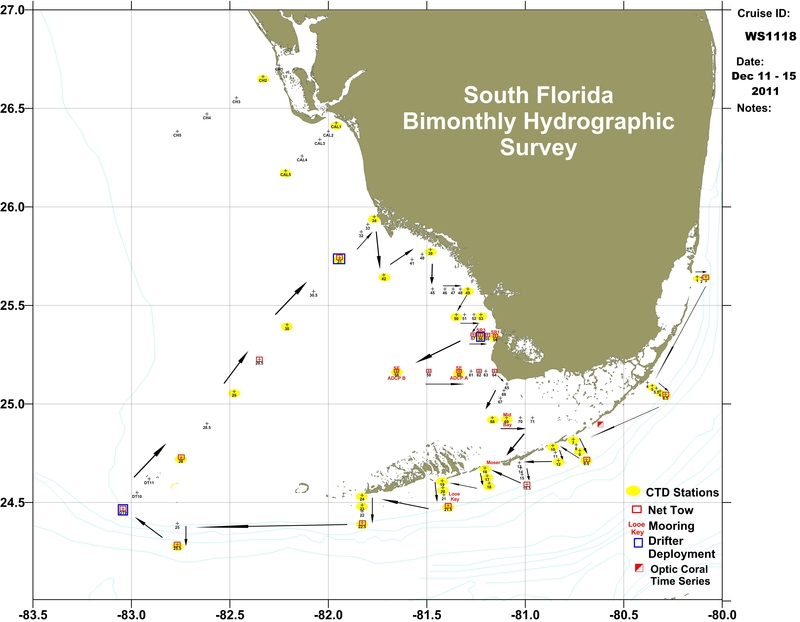 Nelson and his team observed extremely high salinity in Florida Bay, and they used the data they collected to inform policy makers. Today is my last full day on the Walton Smith. The week went by so fast! I had an amazing time and I want to say thank you to the crew and scientific party on board. They welcomed me and taught me so much in such a short time! Thank you also to everyone who read my blog. I hope you enjoyed catching a glimpse of science in action! 2) The R/V Walton Smith holds 10,000 gallons of fuel. By the way, the ship also holds 3,000 gallons of water (although the ship desalinates an additional 20-40 gallons of water an hour). Last night, we deployed our first drifter. There will be three deployed over the course of this cruise. The frame of this drifter is built by the scientists at AOML (Atlantic Oceanographic and Meteorological Laboratory). Afterwards, they attach a satellite transmitter so they can track where the drifter goes. This helps them measure the surface currents. What are some other types of research being conducted onboard? I’m glad you asked! 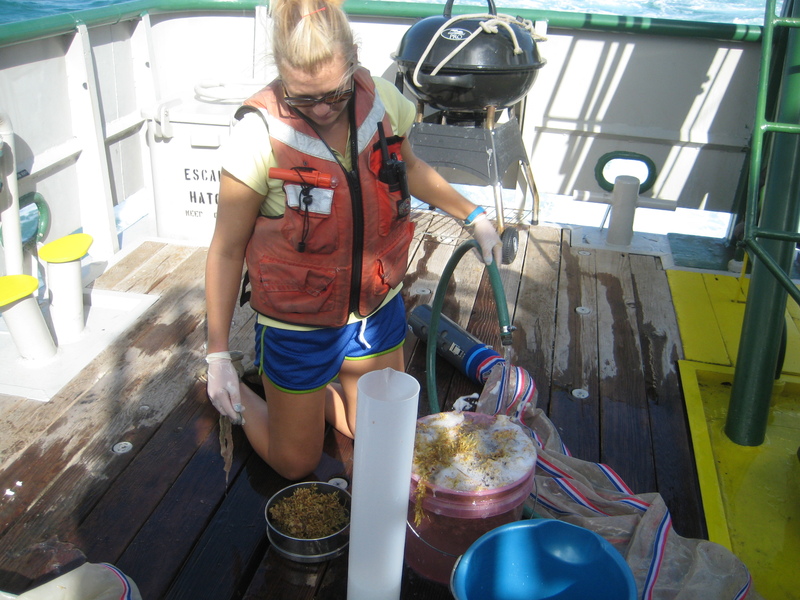 Two NOAA researchers, Lindsey and Rachel, are studying water chemistry and chlorophyll. 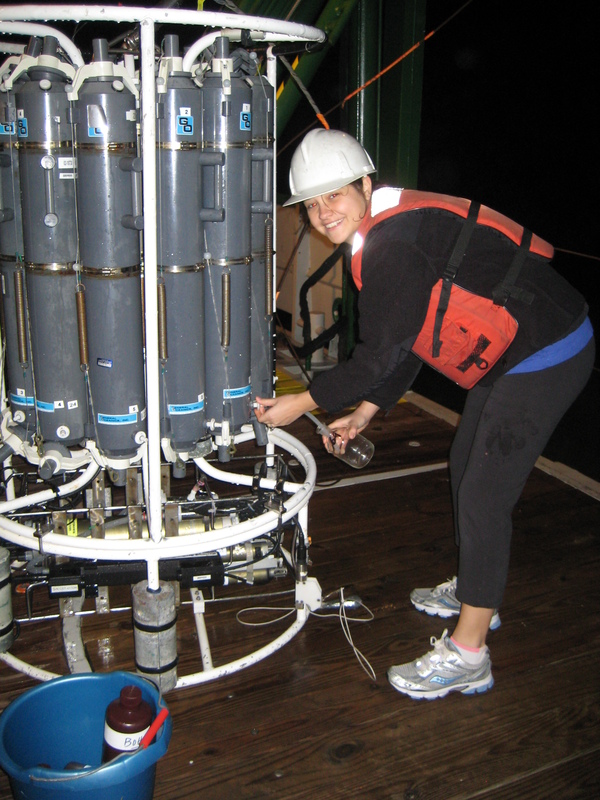 They take samples of surface water from the CTD to study CO2 and the full carbonate profile. They also use water collected at many different depths to study the chlorophyll content. Chlorophyll is an indicator of the amount of phytoplankton in the water. Collecting water from the CTD. Sharein, a PhD student at the University of Miami Rosenstiel School of Marine and Atmospheric Science, is studying a specific type of plankton called copepods. The particular copepod that she is studying is food for the larval stages of some commercially important species of fish such as bill fish (which include blue marlin, sail fish, white tuna, and yellowfin tuna) and different species of reef fish. If a species is commercially important, it means that many people depend on this particular fish for their livelihoods. 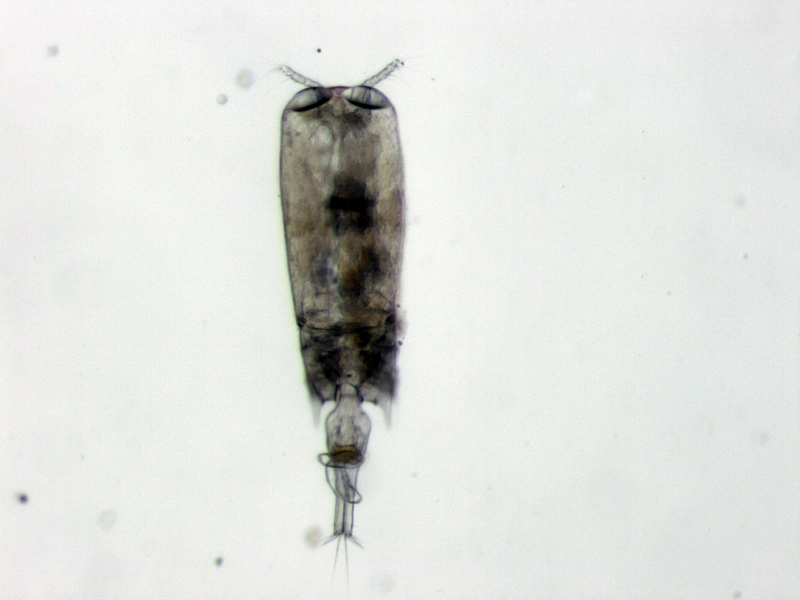 Here is one of the species of copepods that Sharein is studying. When we were on our way to the Tortugas, we didn’t have cell service and the TV in the galley had no signal. It was nice to be disconnected for a while. Although there are still 29 computers onboard which all have the internet, so we’re hardly off the grid! It was hard at first to adjust to the night shift, but everyone onboard was really supportive. Working the night shift means that you work from 7pm to 7am. Today is the first day of the research cruise. The R/V Walton Smith left its home port in Miami, FL this morning at about 7:30am. After a delicious breakfast, the crew and scientific party received a safety briefing from Dave, the Marine Tech. We learned about the importance of shipboard drills and we were shown the location of all the safety gear we might need in case of an emergency. This ship works like a self-contained community. The crew of the ship must also be the policemen and firemen (or policewomen and firewomen). After our safety briefing, the science party went outside to our first station of the day. The first piece of equipment we put into the water was a CTD. The CTD is named after the three factors the equipment measures: conductivity, temperature, and depth. The CTD will be deployed at precise locations along our route. Since they conduct this research cruise twice a month, they can see if conditions are changing or staying the same over time. 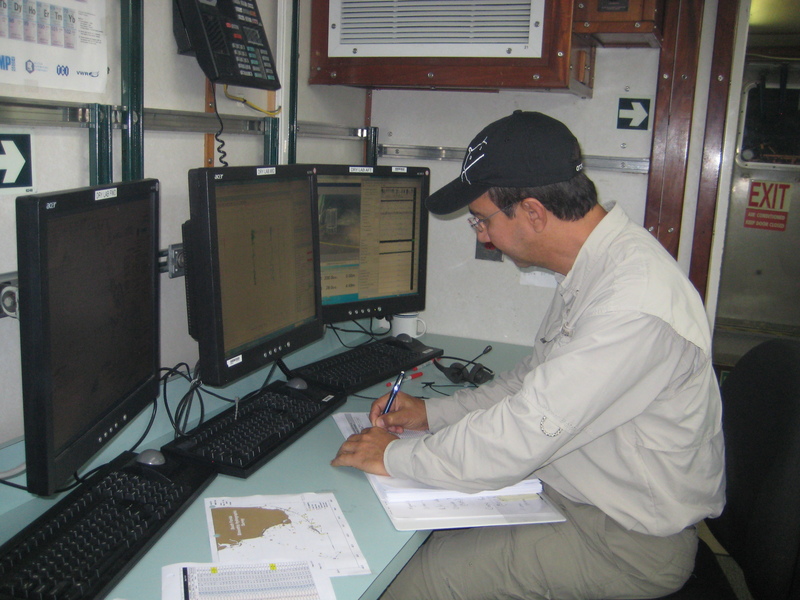 Here I am, reading the data that came up from the CTD. This is the CTD, which measures conductivity, temperature, and depth. Question for students: What is the relationship between salt and electrical conductivity? If the salt content in the water increases, will it conduct electricity better or worse? The next piece of equipment we deployed was the Neuston Net. This net sits at the water line and skims organisms off the surface of the ocean. The net is in the water for 30 minutes at a time. After bringing the net onto the deck, the fun part starts – examining the contents! Our Neuston Net had two main species: moon jelly (Aurelia) and sargassum. The term sargassum actually describes many species, so the scientists on board will study it carefully in order to classify which kinds they caught in the net. Sargassum is an amazing thing! It is planktonic (which means that it floats with the current) and it serves as a habitat for bacteria and small organisms. Since it is such a thriving habitat, it is also a great feeding ground for many different species of fish. 1) We poured water into a graduated cylinder and recorded the water level. For example, let’s say that we poured in 100ml of water. 2) We put a moon jelly into the graduated cylinder and recorded the new water level. For example, let’s say that the new water level read 700ml. 3) We subtracted the old water level from the new, and we could tell the volume of the moon jelly we had caught. For example, based on the numbers above, we would have caught a 600ml moon jelly! Lindsey examines what we caught in the Neuston Net. 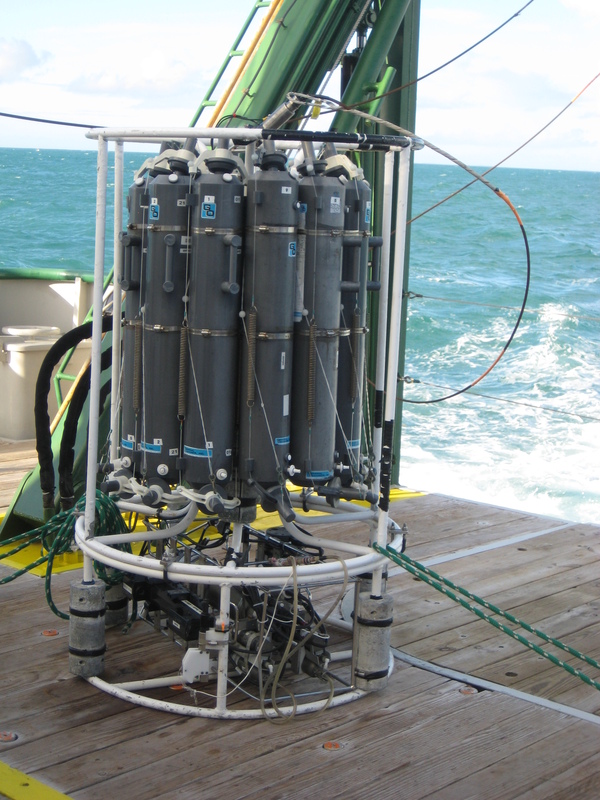 Both the CTD and the Neuston Net will be deployed many times over the course of the cruise. Despite a bit of seasickness, I am having a wonderful time! Everyone on board is very welcoming and happy to answer my questions. Everyone is so busy! It seems like they have all been working nonstop since we arrived on board yesterday. First, let me just say that these are great questions! Good job, Green Acres. Here are some answers, below. 1) How do the currents make a difference in the water temp? The currents play a major role in water temperature. In the Northern Hemisphere, currents on the east coast of a continent bring water up from the equator. For example, the Gulf Stream (which is a very important current down here in Florida) brings warm water from the tropics up the east coast of the United States. This not only keeps the water temperature warm, but it also affects the air temperature as well. 2) How does the current affect the different algae populations? Currents regulate the flow of nutrients (which phytoplankton needs to survive). Strong currents can also create turbidity, which means that it stirs up the water and makes it harder for light to penetrate the water column. As you know, phytoplankton rely on sunlight to grow, so if less light is available, the phytoplankton will suffer. I’m told by Sharein (one of the phytoplankton researchers) that algae are hearty creatures. This means that as long as the turbid conditions are temporary, algae should be able to thrive. Hello! 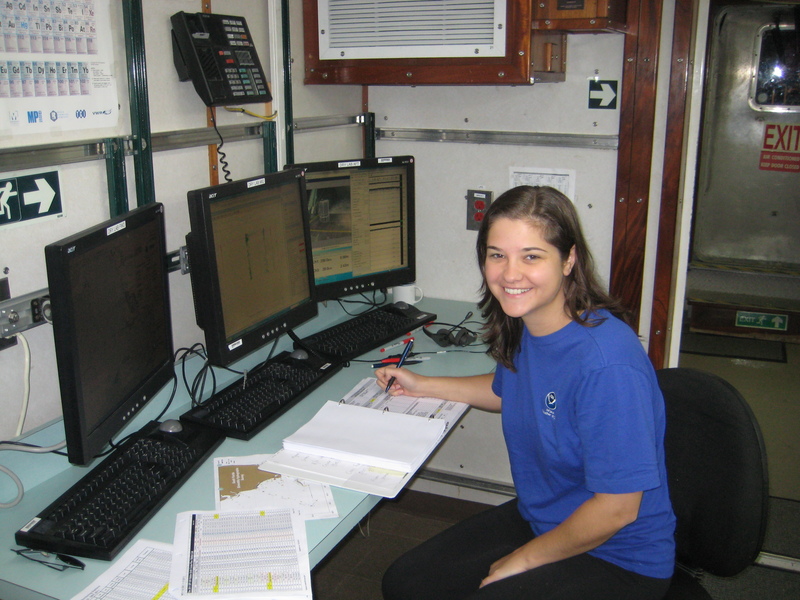 My name is Elizabeth (Liz) Bullock and I work for the NOAA Teacher at Sea Program (TAS). 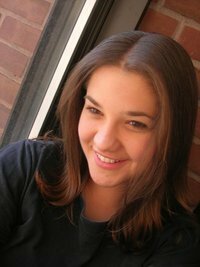 Before I worked at NOAA (the National Oceanic and Atmospheric Administration) I was in graduate school at Clark University in Worcester, MA studying Environmental Science and Policy. As my final project, I created an environmental curriculum for the Global Youth Leadership Institute (GYLI). Through this experience, I realized how much I love both science and educating others about the importance of the natural world. I have been invited to take part in a research cruise on the R/V Walton Smith. I will be participating in the Bimonthly Regional Survey / South Florida Program Cruise. The researchers on this survey are from NOAA’s Atlantic Oceanography and Meteorological Laboratory (AOML) which is located in Miami, FL. What will we be studying? The scientists on this survey are very interested in knowing about the strength and health of the ecosystem. They can judge how strong it is by looking at various indicators such as water clarity, salinity, and temperature. They can also record information about the phytoplankton and zooplankton that live in the water. Here is a map of the route the R/V Walton Smith will be taking. The R/V Walton Smith will be leaving Miami, FL and traveling around the Florida Keys into the Gulf of Mexico. I am so excited and I hope you will follow along with me on this journey of a lifetime!